My first reaction when I read this graphic on an Internet atheism community? Yes, it is TERRIBLE that Jesus Christ (whom serious Christians believe is God’s divine son) had to die on the cross for me and everyone else who believes in Him. In fact, I’ll go further: absolutely HORRIBLE. Totally AWFUL. Overwhelmingly WRETCHED. 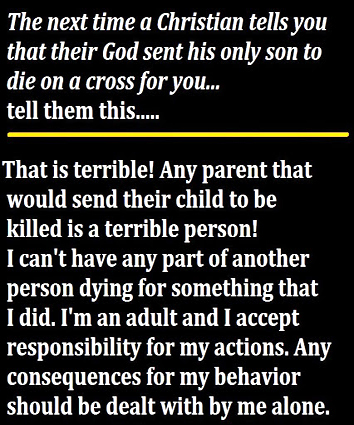 And for us humans, any parent that would send their child to be killed IS a terrible person. But if you have any belief in a Creator, I think you’ll also agree that there’s a *universe* of difference between us insecure, greedy, self-centred, violent, lying human beings and the Maker of time, space and the cosmos. Christianity teaches that this Creator hates “sin” (an out-of-fashion word, but it best suits what I’m writing about). Yes, *hates* it. Christianity also teaches that when this life ends, every one of us will be called on to account for all the wrong things we’ve done and all the right things we’ve failed to do. I guarantee you, without a shadow of a doubt, that you will NOT be able to explain everything away. You will not have reasonable, viable excuses. It simply isn’t possible. The thing is, God knows this. And because the God of the Bible is a just and loving God, He sought a solution that wouldn’t force Him to deny every person passage into Heaven (i.e., spending eternity in His presence). The solution is hard, but Jesus Christ accepted it. He paid the penalty for the wrong things I’ve done and the right things I’ve failed to do. And He paid the penalty for every other person who believes in Him and follows Him. Now, when my life is finished and I appear before God, He won’t see my sins. All He will see is the perfection of His Son. Please don’t misunderstand me. I’m not suggesting that we can all do whatever we want, declare we accept Jesus’s sacrifice and now follow Him, and simply get off penalty-free. Our Creator has no trouble seeing through this kind of cynical, arrogant thinking. If you’ve truly, honestly and seriously accepted the gift of Jesus, then your life will begin to change. You’ll want to be worthy of that gift; you’ll want to live your life so that you become an ambassador for Jesus. You can be that ambassador because you don’t have to do it alone. In a mysterious way, Jesus comes to live in your heart and soul. Furthermore, you’ll want to surround yourself with other Jesus followers who will pray for you, encourage you and keep you accountable. Some may call my viewpoint “peculiar”. I call it realistic – ironically, the very thing for which Christians are so often accused of not being. If you had said that *some* of our fellow human beings are “insecure, greedy, self-centred, violent, lying human beings” I could agree with you. Just take a look at most politicians. I have more trust in a secondhand car salesman. But your claim is about *all* humans, and that’s what I call peculiar. You cannot possibly know all humans on this planet, so you cannot judge them. And about christians not being realistic? That’s about an another subject and it doesn’t only concern christians. Hindus, muslims and most other religious humans have the same flaw. An irrational belief in imaginary being(s). I’m happy to agree to disagree with you on this, Wilko. All humans are deeply flawed. Every. Single. One. How can you be *happy* to think that every single human is flawed. That must be the saddest thing in your life! I know that christians think that in their book there is this thing called the original sin, and as you are a christian you will have made yourself to believe it too. I was brought up in a christian family, went to christian schools, went to church, listened to christians priest, read the bible and I never believed a word of this thing called sin. It just does not make any sense. And besides that it does not make any sense, are all hindus and muslims wrong? Really…. a newborn baby?… in the eyes of a christian it is deeply flawed?! Come on! Only after it has been taught how to hate, lie, be greedy, etc it will become like that. So yes, in my *opinion* 😉 the word delusional fits christians fine in this case. Thanks for your comment, Wilko. Who said I’m “happy” to think every human being is flawed?? It saddens me deeply. Are you suggesting that a newborn baby is perfect? How can you possibly know that? I certainly don’t. How can I know that a newborn baby is perfect? It depends on what you mean by perfect, if you mean physically, no I don’t think that every baby is perfect. Unfortunately. But if you mean to say that it has transgressed of the “law of god” or has “rebelled” against god, yes then I think a baby is completely innocent. It does not even have an idea of when a god is, nor what laws are, nor what rebellion stands for. And what someone did centuries or even millenia ago has nothing to do with anyone alive now. Or do you think that when your great great great… mother slept with the mailman, you can still not go to heaven? I believe your Bible quote is from the Old Testament. The life, death and resurrection of Jesus ushered in a new ‘covenant’ — real and permanent forgiveness and restoration is possible through Him. Yes it is from the OT (Deuteronomy 23:2). I forgot that that is no longer in force, well… the parts that christians don’t like. Jesus said something different about that, but I won’t tease you with that. It still seems a bit odd that a god could not make a decent set of rules the first time. That he had to send his son to make amendments to it. But no comments on whether a newborn baby is free of any sins? I never even hinted that the Old Testament is “no longer in force”. It’s a progression. The Old Testament leads to the New Testament and a new covenant between God and humanity through Jesus. I’m not sure a newborn is aware of themselves beyond the most basic instincts; my position on the brokenness of humanity refers to people who are fully “sentient” and capable of making decisions. Make of that what you will. Aren’t babies human until a certain age? So baby are born without sin, but at some age, suddenly become burdened with the original sin? You know Frank, I see this as a slow improvement on your idea about humanity, you only have to increase the age at what point people are “original simmers” to say, 150 years old and we agree. You know, a few years ago I worked together with a christian (they are getting rare here) who is a really nice guy and who I could talk with about his religion. And yes, we too never agreed about whether god(s) exist or not, but that was no objection to discuss religion or the absense of it. We never talked about sin though and I am curious. Above I see how you seem to struggle to apply (original) sin to all humans, because you and I know that a newborn baby cannot possibly be a sinner. And still it is a human, no doubt about that. How does that work? At what age, mental state, intelligence level, can a human sin? And when does the original sin start to “work”? Martin Luther was at least very clear about it, athough I admit I laughed about it. I don’t have a full understanding of “original sin” and I don’t spend much time thinking about it. And the entire topic is not what I was writing about. In fact, this essay has nothing to do with that subject. Okay, thanks anyway. See you!